What Are Push Along Bikes? A push along bike is a toy bike or childrens trike that usually has a rear handle so that a parent can push their child along on the toy. In general, these are three or four wheeled toys, the most common sort look like pram tricycles. Some are two wheelers but they have far thicker wheels or the rear wheel features training wheels so as to help with balance. The aim of push along bikes is to introduce children to the awesome world of balance, one step at a time. These bikes do have normal handlebars where you’d expect to find them but they also feature a rear safety handle for parents. This handle is important as it gives parents full control over the speed, steering and balance of the bike as well as a quick way to pull their child out of harm’s way if need be. Most handles are adjustable and removable. This means you can set the handle at a comfortable height for yourself and later, once your child wishes to ride solo, you can remove it completely. The trikes often have some type of seatbelt to ensure that their passengers do not fall out. This slowly introduces kids to balance and riding while keeping safety as a top priority. Many of these tricycles have a “Touch Steering” system of sorts. 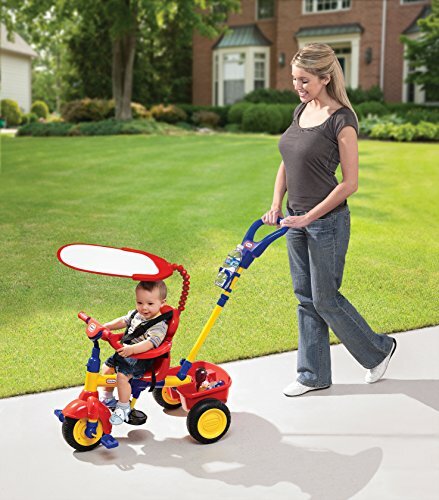 This allows the parent to take full control of the trike and its steering by locking the front handle bars or switch it to a mode whereby the child can take control and steer the bike around. Some of the more advanced push along bikes have up to four different modes to choose from, each giving the child more and more control. Some of these push along bikes resemble prams, with removable sunshades, bells and other accessories. Usually, there is a storage bucket at the rear of the trike, this is great for other toys and all your bits and bobs. Most of these push along bikes have a stationery foot stand where children can place their feet when mom or dad pushes them around, some of these are even retractable for when they are no longer needed. 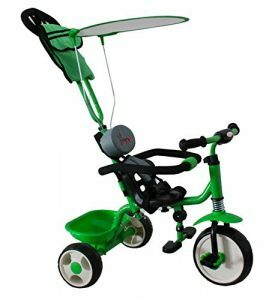 There are also a set of pedals on the front wheel so that children can power themselves around once they feel a bit more comfortable. A push along bike usually has rubberized, shock-absorbing wheels so as to make for a comfortable ride for your little one. The top-of-the-line trikes even have their own real shock absorbers built into the wheel forks. Some have a pouch located at the top of the push handle, in which you can store your phone, purse, camera and other belongings. One fun feature is a front-mounted mirror which allows you to see your child’s face and expressions as you push them around and explore the outdoors. Most bikes have a guard rail that is height adjustable and this surrounds your baby until you feel confident that they will not fall off of the bike. Many of the rear storage baskets or buckets are placed behind the rear wheels and some have a handle grip so that you can easily pick it up and move around with its contents once you’ve parked the trike. 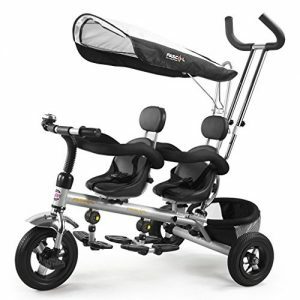 These safety trikes come in all different shapes and sizes, you’re certain to find one that meets your needs and matches your style. Introduce your child to the art of balance and riding in the safest possible way with one of these push along bikes. Why not check out our superb range of childrens trikes and push along bikes.